Grease a deep (19cm x 9cm) loaf pan. Line with baking paper, allowing a 5cm overhang on both long ends. Place eggs, egg yolks and sugar in a heatproof bowl. Place bowl over a saucepan of simmering water over low heat. Whisk for 4 to 5 minutes or until thick and creamy. Remove from heat. Whisk for 4 to 5 minutes or until cool. Gently fold in cream, almonds, rosewater and nougat. Cover and freeze overnight or until firm. To make the berry coulis: place the berries, sugar and water into a saucepan and cook on medium heat until the berries have cooked down and it resembles a simmering syrup. Strain and allow to cool. Stand at room temperature for 5 minutes before turning out onto a plate. 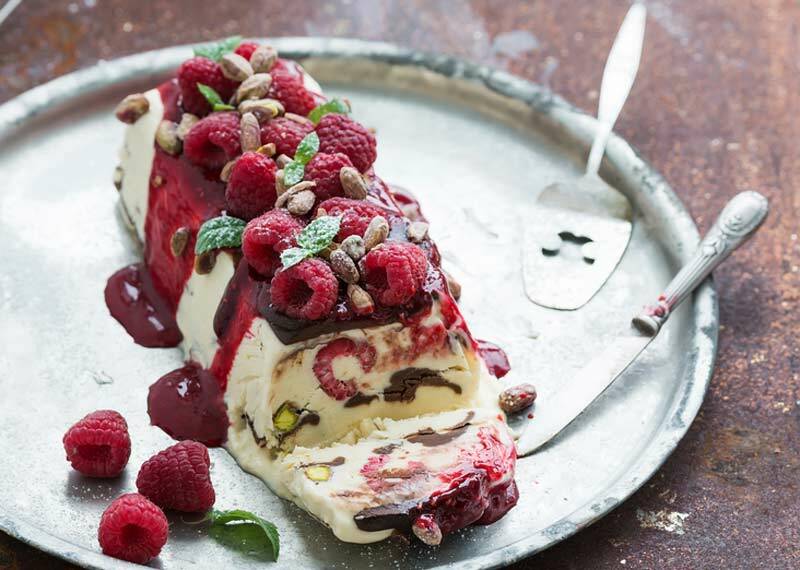 Top berry coulis, mint and fresh raspberries and serve.